Out of the blue one day, a child looked up at me with a great amount of concern on their face. "Where's Duffy? Is he ever coming back to preschool?" For those of you have read the blog often probably know who Duffy is, but for the new readers, Duffy is our Elf on the Shelf. The children haven't mentioned Duffy since Christmas time so I was quite surprised to hear his name! As soon as the others heard Duffy's name it turned into a big conversation, and a lightbulb went off in my head! In storage we have a bin with some stuffed bunnies I planned on using for some Easter invitations, but I thought why not have a bunny buddy hide around our room like Duffy did. At the end of the day I found one of the bunnies, added some accessories, wrote a note to the munchkins, and put her out for the morning. It took a little while for the children to notice Daisy in our classroom, but when she was spotted the news of her arrival spread like wildfire! When I came downstairs the children rushed over to tell me about her, and told me to read the note. Every night, Daisy "hides" in a new spot, and every morning the children rush in the door to see if they can find her. Sometimes Daisy even leaves little notes for the children to find. Daisy has been such a fun addition to our classroom! 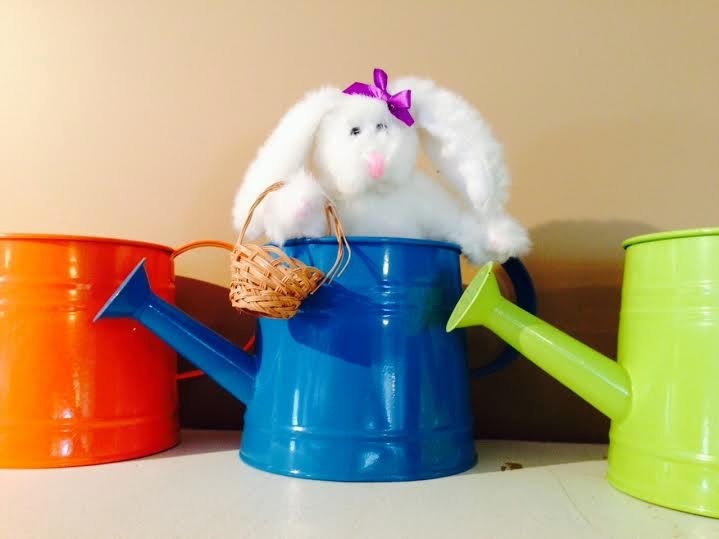 Like Duffy, Daisy will become a new Spring/Easter tradition here at Little Munchkins Preschool Center! 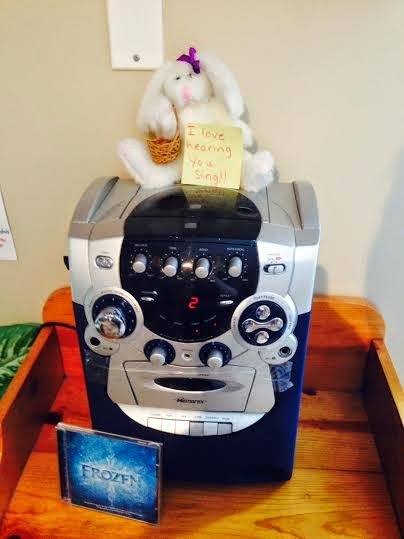 Do you have any special Easter traditions you enjoy doing with your children?